cadre. Currently IOCL Guwahati vacancies are in the trades of Chemical Plant Attendant Operator, Mechanical, Electrical and Instrumentation. Eligible candidates can fill application from online through the official website of IOCL Guwahati from 28-10-2017 to 11-11-2017. There is total 53 vacancies available in this current recruitment of IOCL Guwahati. Candidates will be selected based on merit in Written exam for this IOCL Guwahati Recruitment 2017. 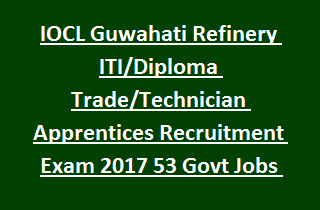 For more details see the below given information of Trade/Technician Recruitment 2017 of IOCL Guwahati. There is 53 vacancies in IOCL Refinery of Guwahati. As on 01-10-2017 candidates minimum age limit is 18 years and maximum is 24 years and for SC/ST 5 years and for OBC candidates 3 years of age relaxation is given. For Fitter Trade Apprentice 2 years ITI qualification required after 10th class. For Technical Apprentices the candidates must have qualified in their relevant field 3 years diploma course full time, regular/sandwich. For all the posts 50% marks required and for SC/ST candidates 45%. Selection candidates will be called for apprenticeship program from 12 to 36 months based on discipline. Eligible and interested candidates have to submit the applications through online only. Application form to be submitted through www.iocl.com-> and click on whats new->click on engagement of apprentices 2017 in IOCL. Last date for submission of application online for this IOCL Recruitment is 11-11-2017. Provide the all information regarding personal details, communication information, educational details, caste details. And also upload the photo and signagture as per given sizes. For any queries mail to grrecruitment@indianoil.in. Please share this IOCL Guwahati recruitment those who are really looking of these vacancies.